Custom Chrome® is one of the worlds largest independent suppliers of aftermarket parts and accessories for Harley-Davidson® motorcycles. A true leader in the industry, Custom Chrome has it’s headquarters located in Morgan Hill, CA and four distribution centers strategically placed around the globe to provide fast service to dealers worldwide. Custom Chrome design and distribute the “World’s Finest Products for Harley-Davidson’s” under the company brand names RevTech®, Motor Factory, Jammer and Santee. 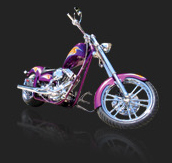 Custom Chrome also sells and distributes products from the top manufacturers and brands in the industry. Brands like Freedom, National Cycle, and Arlen Ness are among a huge list of brands that call Custom Chrome home and that rely on CCI to deliver their products to V-Twin dealers around the world.